As accessories go, scarves are an extremely underrated. They’ll keep your neck protected from the cold winds in winter, as well as the sunshine during summer. Not only that, but they’ll look fantastic while doing so! You’ll find all of our scarves online in this part of the site. 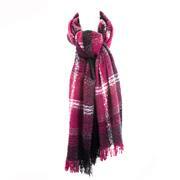 Our range contains a variety of different scarves for women in a selection of different colours. We’ve got Lilley scarves featuring a variety of printed designs that are sure to draw the eye. What’s more, as well as larger, draping floral scarves, we’ve got compact snoods that will keep your neck protected without getting in the way. Whether you’re looking for something plain and classic, or vibrant and eye-catching, you’ll find it among our selection of ladies’ scarves. Each is sure to form a winning partnership with the right items from amongst our selection of gloves and hats. If you’re looking to buy a scarf online, and you’d like the utmost quality for a reasonable price, then you’re in the right place. 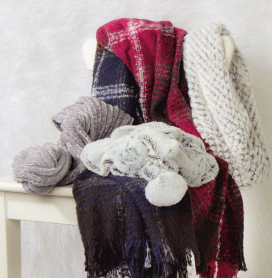 Not only are the scarves you see here inexpensive, but they come with free delivery – so you can shop with confidence! 2 products from £6.99 to £6.99.